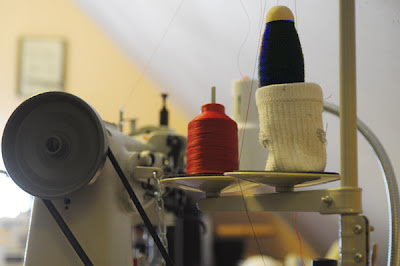 Be it food, furniture, clothing or bicycles, there is nothing quite like getting things made by people we know and trust. 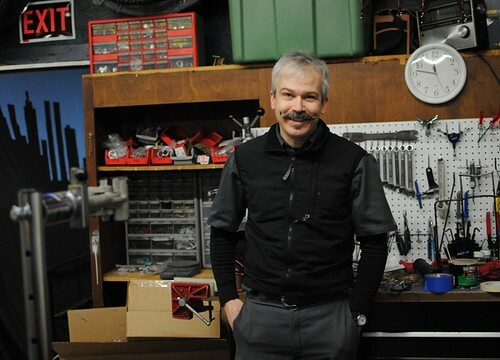 I am lucky to live in a pocket of the US that has a long history of an independent bicycle industry, and luckier still to interact with some of its members. On the occasion of Independence Day, I would like to feature these people here and invite you to have a look at their work. 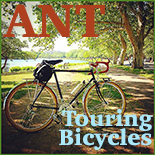 When I first met Mike Flanigan of ANT, he was introduced to me as "the godfather of the transportation cycling revolution." Long before Dutch bikes and retrofitted Porteurs began gracing the streets of trendy American cities, Mike was making sturdy roadsters and cargo bikes for his customers under the slogan "Not sport, transport." He made custom loop frames at a time when no other framebuilder saw it as worth their while to offer step-through frames for women. 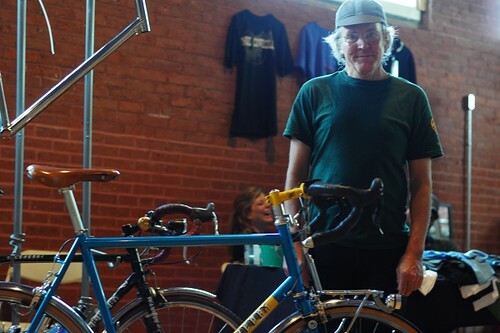 He educated the new generation of local frame builders about the value of transportation bicycles and continues to share his knowledge with them generously. Today Mike also offers framebuilding classes, which have become extremely popular. 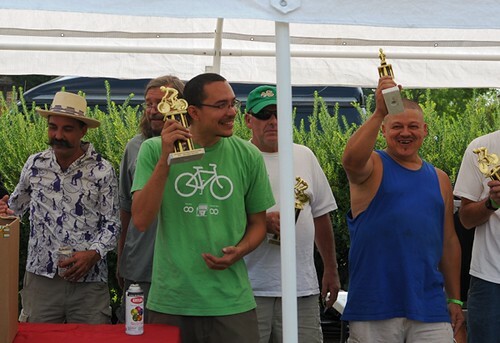 Every year he donates a cargo bike that is raffled off at the Redbones Bike Party and Benefit in Somerville. There are other builders now making transport bicycles and plenty of mainstream manufacturers as well. But there is still nothing quite like an original ANT bike. Of course the new generation makes it look so easy. It's not for nothing that Geekhouse Bikes founder Marty Walsh is known as "party Marty" - combining work and fun is their MO. Or rather, they do not see a distinction. Making colourful bikes that range from track to touring to townie, the boys of Geekhouse work tirelessly on their unique frames and have inhouse powdercoating facilities to boot. Hip segmented forks? Bottle cage braze-ons shaped like lightning bolts? Sparkly powdercoat? They are the ones to see about that. Geekhouse also connect with the local community, collaborating with their peers and encouraging innovation. Most recently they've leased a large space to be developed and shared by local artisans, which is looking more and more exciting each time I visit. Though still a relative newcomer to the framebuilders' scene, Bryan Hollingsworth of Royal H. Cycles can make pretty much anything, I am convinced of that now. 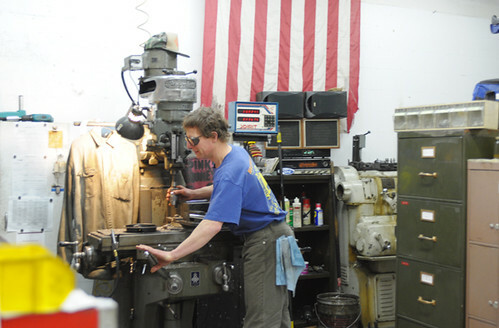 A carbon fiber fabricator at Seven Cycles, his true passion is lugged steel and he has been building frames under his own name for the past three years. I was one of his first customers and watching Bryan work was what inspired my own interest in frame design. After successfully collaborating on a one-off randonneur project last year, this summer we are taking it up a notch and trying to develop a do-it-all mixte model. 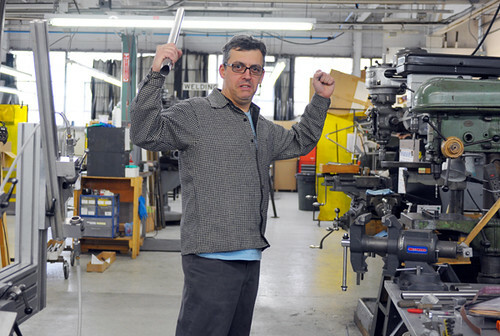 Another Seven Cycles veteran, Mike Salvatore of the so-called Sketchy Cycles is the framebuilders' framebuilder and a man of mystery. There is no website. There is no order process. There is no price list. Working by candlelight in the company of his enormous pet rabbit, Mike builds frames mostly for friends and only when the mood strikes him. But the deceptively modest-looking bikes are known to have magical properties. Those who own a Sketchy - and it's quickly becoming a cult of sorts - only smile mysteriously when asked what makes these bikes so special. Will the rest of us ever know? We can only dream. 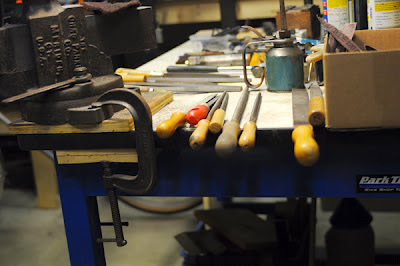 Speaking of dreams, I certainly felt as if I was in the midst of one when I stumbled unexpectedly upon Cantabrigian Mechanics - the shop of Ricky DeFrancisco - earlier this year. What do they make? That is a little difficult to describe, because the answer is "everything." In a sense they are ghost builders - making bicycle frames and parts of frames, and also objects that have nothing to do with bicycles at all, for manufacturers whose names might be quite familiar to you. Intrigued? It may be possible to satisfy our curiosity soon, as Cantabrigian Mechanics are now developing a house brand called Commonwealth Cycles. The art of fillet brazing is on the rise in Boston and I am infatuated with the fledgling work of Nao Tomii of Tomii Cycles - a sculptor who, after years of learning the trade, has recently become a full time framebuilder. 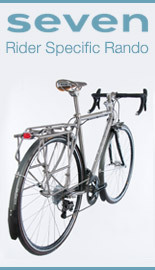 Nao's bicycles look effortless, liquid and floaty as he combines technical precision with an artist's eye. I will have more pictures of his work featured here soon, and this is surely a builder to watch closely. Another new fillet brazer of note is Armando Quiros of Quiros Custom Frames. A favourite of the fixie-loving crowd, Armando has won awards for his track bike builds and admiration for his sharp urban commuters. I met the legendary Christopher Igleheart at a local bicycle show a year ago and was lucky enough to test ride a bike of his. Making many kinds of bicycles, from mountain to randonneuring to city, Igleheart is about lightweight steel, long-distance comfort, and quirky touches. 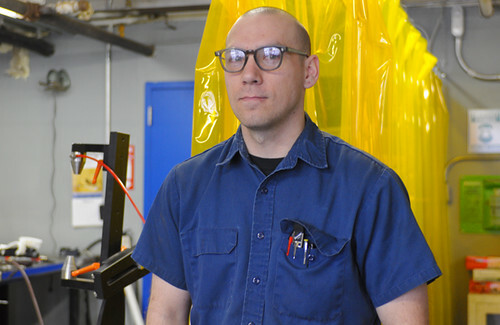 His experience in the industry is vast and his customers rave about his bicycles' ride quality. An old school local favourite. There are other local builders whom I haven't had the honour to visit and photograph, but would like to mention: Peter Mooney, Firefly, Circle A, Chapman Cycles, Ted Wojcik, Independent Fabrications, Parlee, JP Weigle. If there are others I have omitted, please remind me and I will include them. In stark contrast to the framebuilders, as far as accessory makers we admittedly have a shortage. But Emily O'Brien's famous Dill Pickle Bags - not to mention her personality and fixed gear randonneuring adventures - certainly help make up for this. I made Emily's acquaintance recently and have one of her remarkable bags on loan, which I am now reluctant to return. Thank you for reading along. 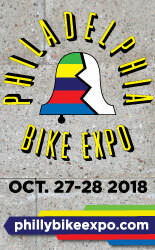 I admit that I am proud of our local bicycle industry, and I try to do my best to feature its members here. What is it like in your area? Please feel free to mention your favourite frame builders, component manufacturers, and accessory makers, and post links so that readers might visit them. Enjoy your 4th of July weekend! Whether despite, because of, or wholly unrelated to the legacy of Schwinn, Chicago does not really have local bicycle manufacturing. There are a few people dabbling on the level of your sketchy, but no dedicated operation. Not to say the city lacks entrepreneurial spirit. Google Dose Market. 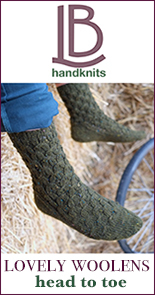 There are cottage industries building in all manner of areas. Just not bicycle frames. Southern Wisconsin has some great operations - many of which spun off from Waterford, which of course can trace its origin to work on high end Schwinns. Indiana and Minnesota also have some shops. No. Heritage specs them, but they are made elsewhere. When I first heard of the effort, I thought maybe Waterford would make them as W'Ford builds for Ben's Cycle in Milwaukee and, of course, Rivendell. But turns out they are made by a small outfit in Ohio. I'm late to this thread, but thanks Matthew J for the insight on lack of frame builders in Chicago. No wonder my internet searches weren't getting me anywhere. I stopped by the Heritage General Store yesterday to check out their bikes. Meh. After seeing many photos of top quality brazing, lugs, etc. on this site and many others, the Heritage frames leave a lot to be desired. Too bad...I'd really like to have a Chicago-made bike. It's good to see the growth in artisanal bike builders here in the U.S. of A. As the global economy continues to disintegrate, it will also be helpful to have U.S. based building supplies and components. On that score we have True Temper tubing and the new KV2 stainless, and as many of your readers likely already know, Velocity recently relocated from Australia to Florida. (Where the aluminum it uses comes from is another question.) There are of course various component manufacturers scattered about. Quality tires could be an issue down the road. Here in the Hudson Valley we have Carl Schlemowitz of Vicious Cycles, but not much else as far as I know. Carl has recently started offering a framebuilding class similar in structure to the one by Mike at ANT. It would be great to see one of the small Hudson River cities (Poughkeepsie, Kingston, Beacon, Newburgh) develop into a regional bicycle building hub. Like the bike boom of the 1890s, there is potential for current manufacturers in other fields to try adding bike-related products. Thompson comes to mind. I helped design a bicycle parking post that was produced by Atlas Industries, a shelving manufacturer in Brooklyn (moving to Newburgh). The days of sending computer files to Taiwan and waiting for the container ship to sail in are numbered. I look forward to your continued coverage of this critical aspect of bicycling! They're all really nice people too. I've been customizing a cross check (adding disc brakes and lowering the trail a bit) and everyone has been helpful and great with my daughter, who's three and is my sidekick. Chris at circle a did the disc tab, support, cable guides and got the kickstand plate (made by ANT.). Marty at geekhouse made the fork and they're doing the powdercoating too. Everyone has been great, done excellent work and very communicative. All of them have treated small jobs with care and precision. I can't wait to get everything back. We're very lucky to have these guys around. Though not local to NE, swift industries has made some great bags for me. Traditional shapes with modern materials. I've got a saddlebag & front panniers that are great. 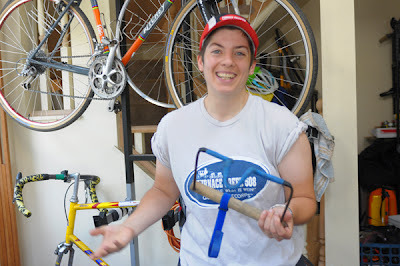 Best Prices for mainstream Bikes, parts and accessories: Simple Living Cycles in Framingham. Best Accessory: Bailey Works Super Pro in NH. Best Bike Path: Minuteman on a weekday. I'm interested in leaning more about: Bamboo Bikes, Fixed Gear Randonneuring, Winter Cycling, AlleyCats and lighter options for bike locks. Lousy experiences: mainstream LBS shop in Watertown, cycling along the Charles during busy Summer weekends, high-end designer bag company based out of SF. Here in Providence, RI we have Circle A Cycles. Their "Hand Built in Providence" bikes are amazing. Not only do they build everything, all the painting is done on site, as well. I'm told this is not typical within the industry. Currently, there are building a Rohloff touring bike for me. From what I've seen their work is amazing. The support for the chain stay on my bike was very elegant on my bike and all of the brazing is very very clean. I see a circle a out and about regularly and the paint is some of the best that I've seen. Marty and the guys were pretty impressed with Chris' work. If I were getting a custom bike built, it'd be hard to choose because we have an embarrassment of riches. I was walking around Kendall sq. the other day and I saw three ants, a geekhouse and a royal h. The guys seem to be doing well. Twin Cities area in MN. has numerous frame builders to choose from. Some are listed below. I see you're still on about wishful thinking wrt ti loops. It'll twist up, but I've said that before of course. Yeah the Brompton has run its course -- time to replace it. I wouldn't want a Ti loop frame myself, but I think it's a neat concept. Several local builders are talking about it, so might happen. I'd be interested how they resolve the twisting thing. Cantabrigian is what's know as a jobber. Note: all this local fab is good, but what is not clear is the experience level or expected ride parameters. Ime some of the many, many reputed handcrafters do not build extremely good, efficient race bikes due to various reasons. Go down a notch or two and pretty much anyone with fabrication skills can cobble together a nice-riding bike, as the available tubing is of very high quality and everyone uses the same software. It's not quite as easy as cobbling together eight bits of tubing and following a plan, as though it were a recipe. It doesn't work that way, however nice your tube set and CAAD drawings. Second, off the top of my head I can think of small and even one person shops such as Sachs, Speedvagen, Retrotec, Sycip who sponsor race teams. Finally, software does not fillet braze, file lugs, and make paint just the right color. That comes from experience and craft. Roff -- I agree. It's not simple but my point is many of the new builders are using customers as beta testers in their learning process, "art" taking precedence over an nth degree of fine development. There are two other builders in Boston that also work at Seven. Saila Cycles (Lauren Trout) and Kualis Cycles (Yoshi - can't remember his last name). Both very talented builders. I'm a middle aged Englishman. The general quality of nearly food and material good has increased vastly over the last 40 years of my memory and at the same time they have been increasingly provided by people all over the world who I don't know at all. As for bikes, I'm a fan of the English steel frame and like to buy local for them - but even then I'll buy over the internet rather than travel 50 miles to Leeds to actually pick the thing up in person. You must be kidding, or else you've never looked around. England has a lot of very fine frame builders. You need to get more in the loop. And I am not saying this as an Englishman trying to boost his country - I am an American-birn Australian. To my mind, the benefit of having a profusion of local craftspeople really shows when it comes to smell niche markets with specific needs. When you buy your gear (especially something as expensive and involved as a purpose-built custom bike) from someone whose specialization comes from participating in that same activity, they'll have much more of an understanding about your needs and what small details might help you. They have much more flexibility to respond to new ideas and changes than larger companies. And some things that eventually make their way into the mainstream start out because a few small manufacturers are trying to satisfy a particular need of a small subset of people. Of course a frame that is constructed under the watchful eye of a large rabbit is going to have a magical quality. How could it not? As always, drooling and sighing from the Antipodes. I have a huge admiration for people who go out alone and take a risk to do something they have a passion for. So, it's always wonderful to see their success showcased. In Northern California we have a great framemaker, Steve Rex of Rex Cycles. Steve is an avid cyclist ( he and his wife have finished PBP on their tandem several times ). 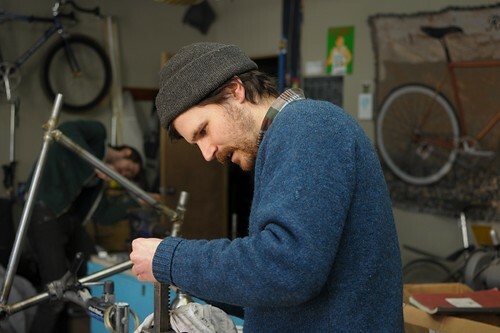 His forte is fillet brazing, but he also builds some beautiful lugged frames. I am fortunate enough to live a short ride away from Enigma Bikes, here in Sussex. Their master frame builder Mark Reilly is among the very best in Britain. They build with titanium and very sweet riding steel tube sets - Reynolds 853 and 953, and Columbus Spirit and XCR. 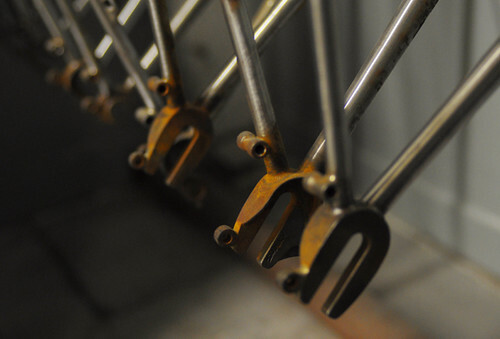 I have had the good fortune to get to know them rather well, learn a bit (vicariously) about brazing and have been able to photograph the frame building process which truly is an art - and a visually appealing one at that. I'd also like to give a mention to fastboy cycles, Ezra's bikes are art. i'm guessing one out of ten thousand will buy a custom bike.